Last night I needed a little extra help to keep calm. My working life is spiralling out of control and most days I would rather just stay in bed, pull the covers over my head and wait till sun set. Unfortunately this isn’t going to happen. I must keep pushing forward. From an outsider my life, most likely seems perfect. I have an incredible husband-to-be, I don’t even need to go into details. He is just incredible. I can’t wait to say “I do”. This is all very exciting. However, what’s lurking under the covers is my constant battle with work and finances. I am 31 (32 in mere five week’s) and career-wise I am nowhere near I wanted to be. I wanted to be a vet when I was little, but then worked as a vet’s assistant, that went out the window! At uni I did degrees in PR and Marketing, thinking that was what I wanted to do. Turns out, not so much. The last three years I have been in a job that I have learned to like and just before end of 2010 I realized that I wanted to become a journalist, this is the road I am still on. Trying to make this happen, seriously. Pushing from every direction possible, but nothing. I have been turned down on numerous vacancies in the last three months and this week it all got a little too much as my bank account is looking scary empty. I can’t see the light, the tunnel is dark and cold. Seems that there is no way out. So, I drank my coffee from this mug. 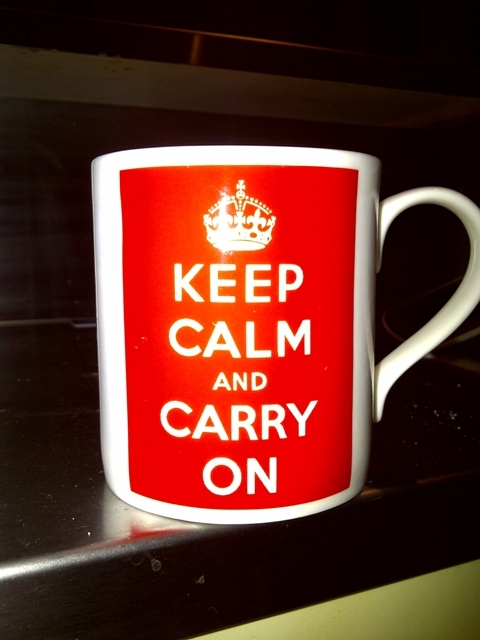 “Keep calm and carry on”. Which is exactly what I am going to do! No other way around it. This will happen. I know it will. I would just like it to happen sooner than later. Dear Universe, I am asking nicely.